Listing courtesy of WIREX_RANW / Schroeder and Kabble Realty, Inc.
South on Main Street (Hwy 110) to East on Garfield through intersection to sign on property. Window treatments, pellet stove & pellets. Hello, I’m interested in 333 E GARFIELD AVENUE and would like to take a look around. 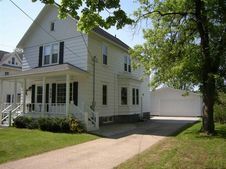 The details on 333 E GARFIELD AVENUE: This house located in Marion, WI 54950 is currently for sale for $124,900. 333 E GARFIELD AVENUE is a 1,800 square foot house with 4 beds and 2 baths that has been on Estately for 336 days. This house is in the attendance area of Marion Junior High School and Marion Elementary School. Listing Courtesy of: WIREX_RANW and Schroeder and Kabble Realty, Inc..